Poo-Poo and Karen, in case you don’t know, are dogs. 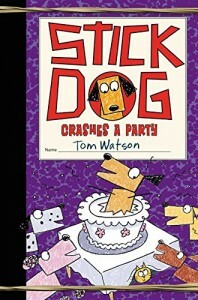 Not just any dogs but dogs that hang out with Stick Dog, who is the main character in this children’s book, and all the others with his name on it. A while ago, I reviewed the Stick Cat books by this author, mainly because I love cats, and didn’t think I’d enjoy dog books. But that was a totally wrong assumption. Humor is humor, silliness is silliness, and Tom Watson delivers both, regardless of whether it’s about dogs or cats. You may ask if a children’s book about a stick dog (or cat) really qualifies as good literature. Well, no. But the stories all are enjoyable, easy to read, very harmless, and for the most part uplifting and funny. So from time to time, I think we all need a break from the heavy moral lessons of the world. Animals are the best way to remind us that life is short and sweet. And I think Tom Watson does a great job of bringing the world of animals right into his books, so we can just be joyful. I offered one of this series to my 10-year-old grandson, and it took less than two hours for him to read it from start to finish. They are either like candy for older (8 to 10) kids, or a reading adventure for 6 to 8. Either way, there’s a lot more books (at least nine, right now) in this series, so if they work, keep getting the next and the next. This particular children’s book is the latest in the series, and I didn’t read any of the earlier ones, but that’s not a problem. The characters are pretty self-explanatory. Great books for reluctant readers.